They bite, even through paddling gloves and clothes. And, unlike mosquitoes, they will follow you on the water, making forays on your exposed (and unexposed) areas if they find themselves into your cockpit. Yellow deer flies are pestilence particularly at the Gully Branch Landing on the New River. This entry was posted in Uncategorized on May 12, 2018 by marylynanded. Rock Landing road crosses SR 67. On the west, it’s a straight drive to East River drive, which intersects to the south and then jogs to continue about 100 yards further west down Rock Landing road. Camp site 17, a nice site for paddlers because it has an easy take-out and put-in, and large flat camping area, is about 3 campsites north when Rock Landing road ends and East River road north takes over. A month ago, the river was very low. With over 2 inches of rain last week, the New River looked much more promising for paddling upriver from campsite 17. 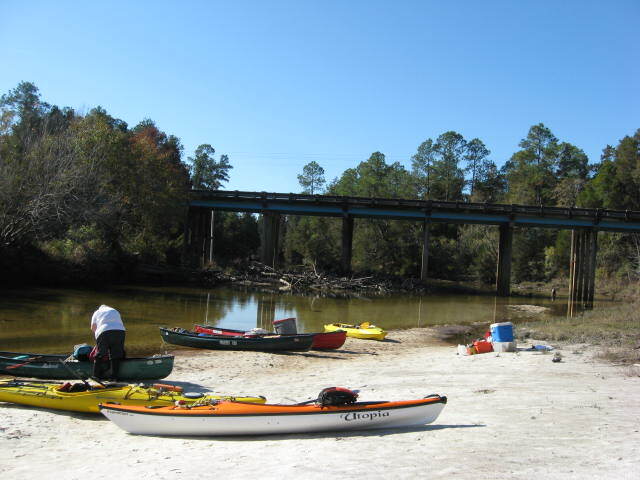 This entry was posted in New River, Tate, Tate's Hell State Forest, Uncategorized and tagged New River, Tate's Hell State Forest paddling on February 14, 2018 by marylynanded.